> Why choose 3D prod ? From the largest to the smallest … and always the same quality ! 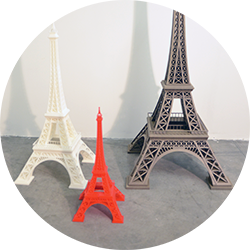 We are not only a online 3D printing service, we have also one of the largest production capacities in France. That’s why we can offer you very small prints, but also very large ones (going up to 2 meters) and all that in quantities which can reach several thousand parts. No matter what your need is, high printing quality is always guaranteed. Thanks of a broad range of technologies, Stereolithography, Powder Laser Sintering, Multi Jet Modeling, Fused Deposition Modeling, Vacuum Casting, and of available 3D printing materials, you can print models, serial parts or prototypes. To get the most realistic result as possible, a broad range of finishing options are available. We are not only seeking for the satisfaction of our customers with regard to the rendering of their part, we wish that your whole buying process is as efficient as possible. Whether you order online or directly via our sales department, our team is responsive to answer your questions and to assist you throughout your project : creation of your 3D file, choice of technology and material, choice of finishing options … until the part will be delivered to your door, satisfying your requirements and even beyond. Of course, if this was not the case (unfortunately this can happen), we shall do our very best to find a quick and efficient solution to satisfy your need. This is also service ! What’s the use in having a nice part if it doesn’t arrive in time for your meeting, your trade fair or your presentation ? We know that often you need your parts « in no time at all ». That’s why meeting deadlines is our everyday concern, as well as quality and prices. With our online 3D printing service, you can immediately prepare your quote and pay online, if you wish. Quality, price, delivery times with service on top.